Last night we discovered there was only mildly warm water in the taps. This was disconcerting as the immersion heater in the calorifier had been wired into the shore power last Wednesday and we subsequently had hot water. Today I did some fault finding, working my way through the connections back the calorifier. It appeared the problem was the immersion heater and I was worried it had “blown” as there was no resistance in the circuit (open circuit). Eventually I entered the engine compartment and managed to get the cover off the immersion heater terminals. After some probing around with my multimeter I established there was resistance in the heater element but one of the thermostats had an open circuit. After disconnecting the wiring I was able to extract the “open circuit” thermostat from the immersion heater. This proved to be rather tricky as the area is very confined and these days I don’t have very good close vision. Being partially blind in one eye doesn’t help either! Andy had a look at the thermostat and removed the label marked “Warranty void if removed”. Underneath was a reset switch which he duly pushed and even I; being partially deaf; heard the “click”! I managed to refit the thermostat into the immersion heater but I couldn’t connect the last wire because I lack the ability to see it! Nick came over and re-wired it for me. So what did we learn? The immersion heater consists to a heater element and a thermostat with adjustable settling enabling the water to be heated to 75 deg C. The second thermostat is a safety thermostat which is sealed and designed to “trip” (cut the power to the heater element) if the temperature reaches 75 deg C. This makes sense. If the first thermostat was to fail the heater element could boil the water in the calorifier. The second thermostat prevents this occurring. What Nick has now done is to adjust the setting on the first thermostat down to 65 deg C. We surmise the second thermostat “tripped” because the 2nd and 1st were both set at 75 deg C. If Jan and I use the hot water in the calorifier for a shower tonight and there is hot water in it tomorrow morning then we will know this problem is resolved. The other problem was the Spinflo gas oven. Jan attempted to bake bread today and the oven kept turning the gas off after running for approximately 10 minutes. It appears to be a fault with the oven and Andy has arranged for Spinflo to come and have a look at it. No daily freshly baked bread or cake for me! However at least the gas hob is working. Meanwhile Richard and I have been working in the back cabin. The freezer compartment has now been constructed above the washing machine. As explained in an earlier post, I cut the spare 500mm wide galley drawer in half with an angle grinder. 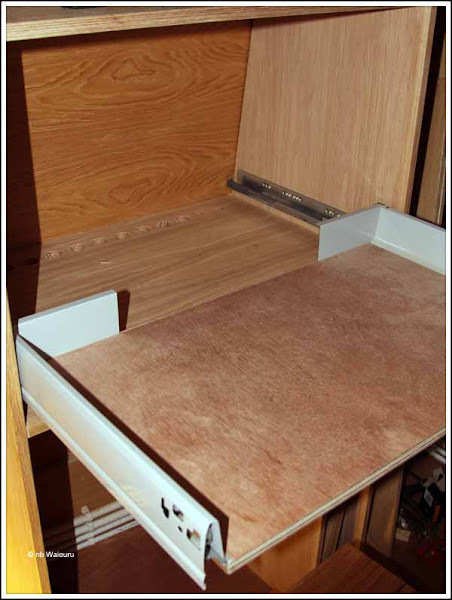 Richard then made it wider by inserting a thicker piece of ¾” ply on the base. The chest freezer will now fit lengthwise on the drawer. You may be able to see the row of holes I have drilled in the shelf between the washing machine and freezer compartments. My reason for doing this is to improve the air circulation around the freezer motor in an effort to improve its efficiency thereby reducing energy consumption. 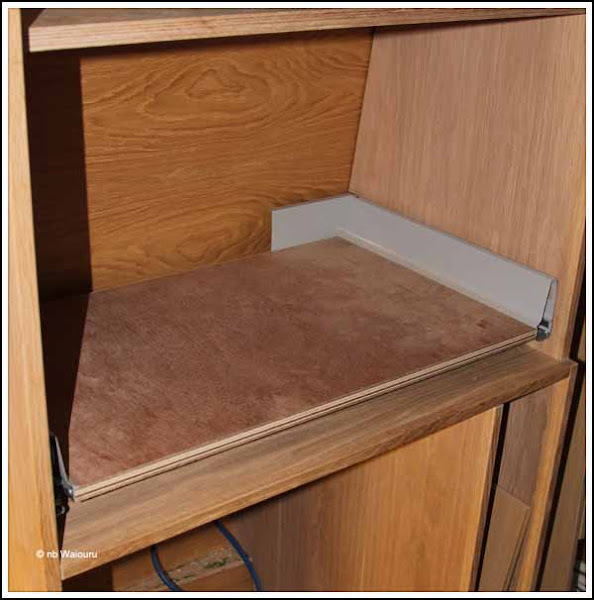 The freezer drawer will have a full height front panel made from ¾” oak veneer ply . There is still room for another large cupboard above the freezer which Jan is claiming for additional food storage. Tomorrow Richard and I will make a start on the work station for the laptop and printer. I fear that your thermostat settings may leave you with a problem when you start cruising. The water temperature in the calorifier will tend to rise to engine temperature which will be higher than 75 degrees. I am not sure if different settings are available for safety thermostats but as I recall the one on my boat is set to 90 degrees. The thermostat is in the 240v circuit and therefore is only activated when on shore power. We are anticipating the water in the calorifier will be considerably hotter when using the engine or Hurricane heater. Your comment noted but do your thermostats actually require 240V to click open and closed? Mine are mechanical and, while they only switch the heater on and off when there is power, the contacts operate without power. For the safety thermostat this means that it has to be manually reset after exceeding its set temperature even though the circuit is switched off. A good question and unfortunately I don't know the answer. We'll probably find out the first time we go back onto shore power after running the engine.